With a few simple household materials, you can create homemade cat toys your kitty is sure to love! Get tips about making some basic toys that will entertain your cat for hours. Cats are predatory animals by nature. This is an instinct and a learned skill, both from their mother and from you, of course. How many times do you buy a toy only to find that kitty doesn't like what you bought? Did you know that cats have extra good eyesight in low light, so shapes and noise excite them? Paper or ping pong ball - Believe it or not, your kitty can have hours of fun with this. Simply take a large piece of paper, crumple it into a ball and throw it. String toys - Attach a feather to a piece of string or use a fishing pole with fun creative lures at the end such as bells or lights. I like stuffing a stocking with some catnip and attaching it to the fishing pole. Bag toys - Never use a plastic bag for these homemade cat toys; instead, use a large paper bag from a supermarket or department store. You can also do this with a cardboard box, just be sure to remove all staples and tape. Mouse-like toys - A friend of mine taught her cat how to play mouseball using a toy mouse and throwing it in the air. The cat would swat it towards her; she would catch it and throw it back in the air just like baseball. Toys with lights and sounds - Take your bag toy and put bells, balls or lights inside, and then close the bag up and watch kitty try to get into it. Catnip toy - Not all cats are affected by catnip, so you will have to test your cat. If he is catnip sensitive, do not over use it because he can get overheated and exhausted. An empty toilet paper roll or paper towel roll makes a fun toy. Empty plastic bottles with labels removed and bells or lights inside (what I like to call the bug in the jar) will make your cat go crazy for hours. Blow bubbles! Easy for you and fun for your cat. 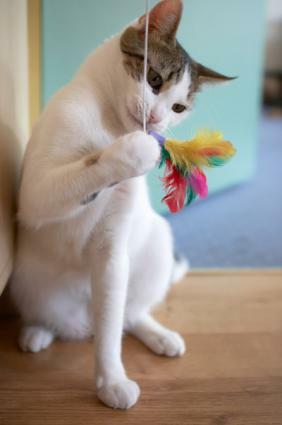 Save bungy cords, fuzzy toys, feathers, bells, little lights and all sorts of things that you thought were junk because when you are feeling creative, you have a whole toy store for your kitty. Be sure to always have a perch that he can sit on - cats love to look out of windows. They even love to sit in one room and watch you from another. To make your own perch, get a piece of wood, and cut it to size for a window box or make a stand. Purchase a scrap of carpeting from the carpet store and fold it over your piece of wood, staple it and you are ready to go. Install brackets to hang your perch from a wall or window. One thing to always consider is a providing a scratching post for your cat. There are three types of scratching posts: vertical, flat or all out 2-in-1 (a flat scratching post with an arch over it so cats can scratch their backs while kneading the floor portion of the post). You can make your own scratching post similar to a perch by purchasing a round or square piece of wood to use as the post. You then need a flat piece of plywood, cut to size such as 3 x 3 feet square, and a square round post two feet high. You can hot glue them or nail them together. Before you attach your two pieces, wrap your post with carpeting or sisal (sea grass). Make sure that any paint or stain you use is non-toxic. A scratching post is an excellent homemade cat toy.